This Can’t Be Beat- Easy Valentine gift is the perfect way to brighten a teachers day or gift a friend this Valentines Day. 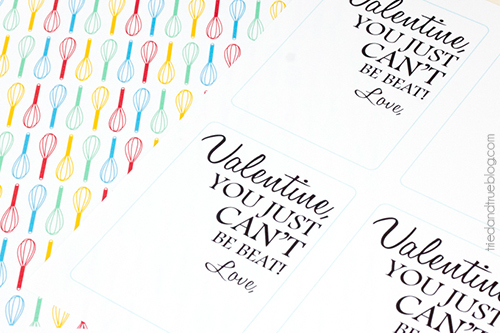 You don’t want to miss these Love Candy Bar Wrappers because Chocolate makes the perfect Valentines gift! Don’t miss these amazing Valentines. 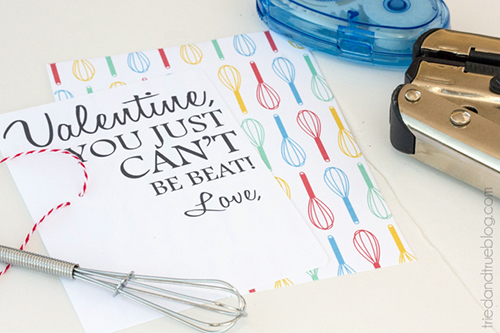 I have teamed up with some of the most creative bloggers to share the cutest Valentines imaginable. Each day you will be amazed with their cleverness! Don’t miss a day! Hope to see you tomorrow. Hello, Lovely Skip To My Lou Readers! My name is Vanessa Brady (Tried & True) and I’m so happy to be sharing this easy Valentine gift with you all. I don’t know about you guys but even with the best intentions, I’m always running behind when it comes to Valentine’s Day. Quick and easy is my motto for the holiday and this “Can’t Be Beat” gift totally fits the bill! I used a miniature whisk I had left over from Christmas gifts but feel free to use the label with any size. Hope you enjoy! This post may contain affiliate links for your convenience and to assist in the maintenance of my site. Step One. 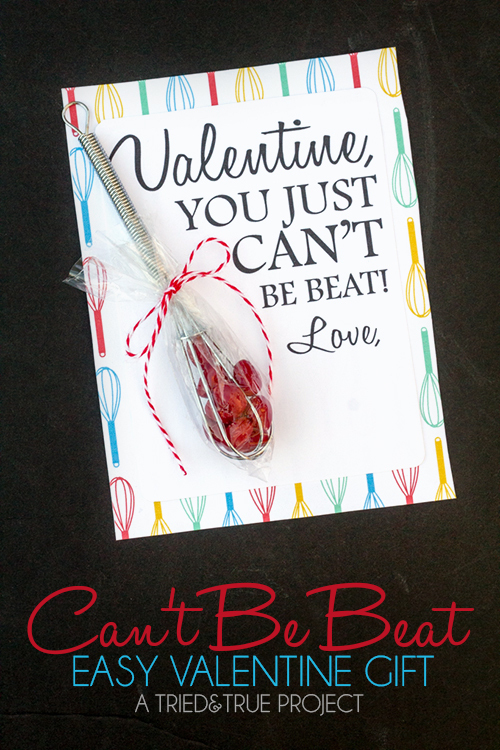 Print and cut the “Can’t Be Beat” Free Printable Label. I’ve designed it four to a page for your convenience. Step Two. Use a 1/16″ hole punch to thread a piece of baker’s twine through the front card. Apply glue to the back and stick in place over background paper. Step Three. Fill miniature beater with the small cinnamon candies (or any other small candy of choice!) and wrap a small piece of cellophane around it. Secure in place with baker’s twine. So super easy, right? I’m definitely planning on gifting this to a few of my favorite foodies! 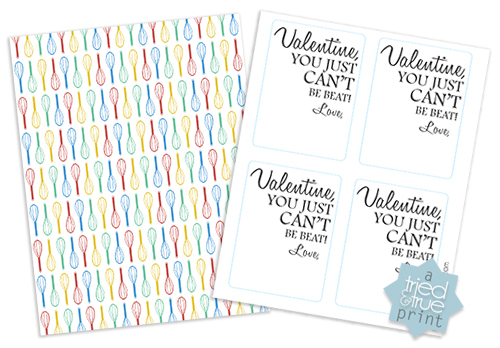 You could even use a regular sized whisk with this card attached to the top if you want (although I’m quite partial to these super cute little whisks!) Thank you, Cindy, for letting me guest post and I hope everyone has a great Valentine’s Day! 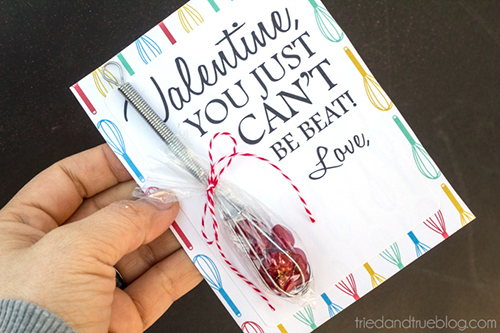 Stop by Tried & True to check out some of my other Valentine’s Day crafts, including a Valentine Tumble Game, Valentine’s Day Tote, and my personal favorite, the “I Love Everything About You” Coloring Page! I’d love to keep in touch with you through the following links!